Mini brown Teddy bear in Sock is from the Steiff Classic collection and is hand made in beautiful brown mohair and wears the famous Button in Ear along with the yellow ear tag. Mini Teddy bear in stocking makes a wonderful ornament for the Christmas tree. This cute brown bear has a height of 8 cm and is made from very fine mohair. He comes with a knitted stocking featuring a Christmas pattern. 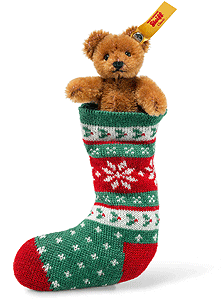 This stocking is stuffed with cotton and the bear can be removed from it. The stocking has a little loop that can be used to hang it up on the Christmas tree.